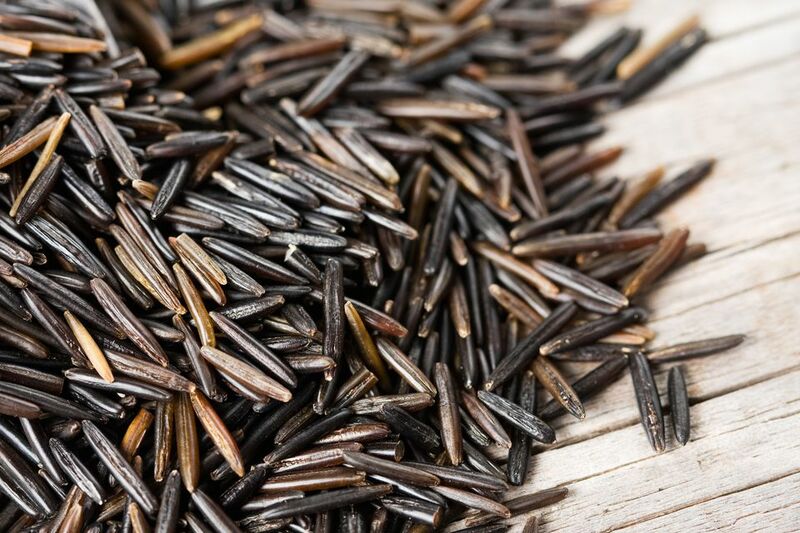 Wild rice is the seed of an aquatic grass that grows wild in the lakes and streams of Minnesota, Wisconsin, and nearby areas of Canada. It is also cultivated in paddies in Central California, which is where most commercially available wild rice in most of the U.S. comes from. It has a wonderfully deep nutty flavor, tastes great plain, topped with butter and salt, or in salads, casseroles, or soups. Best of all, it is super easy to cook. Before you get started, it's good to know that cooking times can vary greatly depending on how the wild rice was dried, how long it's been stored, and whether it's true wild rice or cultivated wild rice, so be sure to bite-test it along the way and follow the rice's texture over any of the suggested cooking times below. No matter which method you choose, always rinse wild rice thoroughly in cold water before cooking it and know that 1 cup uncooked wild rice yields 3 to 4 cups cooked wild rice. Then boil, steam, bake, or microwave it to perfection with these easy steps. Boiling is a classic, some may say go-to way to get wild rice ready to eat. One of the reasons it's so popular, besides how easy it is, is that boiled wild rice tends to have tender but still intact kernels. So if you want wild rice to use in a salad, you'll be best off boiling it. Boiling also gives the cook a bit more control over the texture than does steaming. Bring 6 cups water to a boil. Add 1 teaspoon fine sea salt and 1 cup wild rice. Bring everything back to a boil before reducing the heat to maintain a low boil. Cook until the rice is tender, about 45 minutes. Drain the rice in a sieve or fine-mesh colander. Serve warm or rinse with cold water to cool and use in another dish. Steamed wild rice has many popped kernels and a very tender texture. People tend to turn to steam when they want to serve wild rice on its own, simply topped with butter or, for a delicious breakfast treat, maple syrup. In a medium saucepan, bring 1 cup wild rice, 3 cups water, and 1/2 teaspoon fine sea salt to a boil. Cover, reduce the heat to maintain a steady simmer. Cook until the rice is tender and the kernels pop open. Depending on how the rice was cured and how old it is, it will take 45 to 60 minutes. Uncover the rice and fluff it with a fork. Simmer 5 additional minutes, stirring occasionally. Drain off any excess liquid, if necessary. This is a great method that often gets used when making wild rice-based casseroles or to use wild rice as a stuffing, but it works just as nicely (with a lovely hands-off element) when just cooking up basic wild rice. Combine 1 cup wild rice with 2 cups boiling water or broth and salt to taste in a 2-quart casserole with a tight-fitting lid. Cover and bake at 350F for 1 hour. Check the wild rice. Add more water or broth, if needed, and fluff the rice with a fork. Continue baking until the rice is tender and still moist, about 30 minutes. This method leaves a bit to be desired: it's not all that fast and it can be tricky to get the right texture. That said, sometimes a microwave is what's at hand, and a person can certainly cook wild rice in one. Combine 1 cup wild rice and 3 cups water or broth and 1/2 teaspoon fine sea salt in a covered 2-quart glass or another microwaveable container. Microwave on full power for 5 minutes. Microwave on 50 percent power for 30 minutes. Let stand 15 minutes and taste: the wild rice should be tender. If it's not, microwave in 2-minute increments until it is. Drain, if necessary. It's also possible to pop wild rice the way you pop popcorn. The result is crunchy kernels perfect to use as a garnish on salads (it's particularly good on kale salads) or sprinkled onto creamy wild rice soup.